A coffee table may be named for holding beverages, but there are so many other uses. They have so much functioning potential that they have become a furniture stable in most homes. Placing them in front of your couch will allow you a place to set your book, your meal, your controllers, remotes and yes, your coffee, too. If you’re in the market to pick up a coffee table, but are finding that deciding on the right one for your home to be a bit difficult, don’t stress. We have all the information you’ll need to make the right choice. We reviewed dozens of coffee tables to identify the best of the best. We looked at ottomans and trunks as well as top rising coffee tables that will function as desks, as well. We looked at glass tops, wood, metal, and everything in between to find the selection that will fit your home best. For a coffee table that will meet all your needs and then some, look no further than the Emerald Home Chandler Rustic Industrial Coffee Table. All through our research the Emerald Home Chandler Rustic Industrial Coffee Table stood out as the obvious choice as our top pick. The rustic design is a classic choice and the quality of its materials make it a table that will last for years to come. The Emerald Home Chandler Rustic Industrial Coffee Table will contribute to the rustic or industrial feel to any home. (Hence the name, of course). The distressed hard wood will give your home a timeless look, which is all the better because the quality of materials makes this table one that will last. It has a thick solid wood table top and bottom shelf along with a solid steel frame that make it perfect for kids or rowdy guests. If you’re in the market for a whole new living room table set, this is an excellent option as it has side and sofa tables included right alongside this listing. So you won’t need to worry about matching your room; it’s all right there for you. There are plenty of fans of this coffee table on Amazon; over 1,200 customer reviews have earned this an overall rating of 4.7 stars; not too shabby! In fact, those are such good numbers, we think it’s safe to say you’ll love it. For a simple beauty to add a bit of class to any room, try the Winsome Genoa Rectangular Coffee Table. 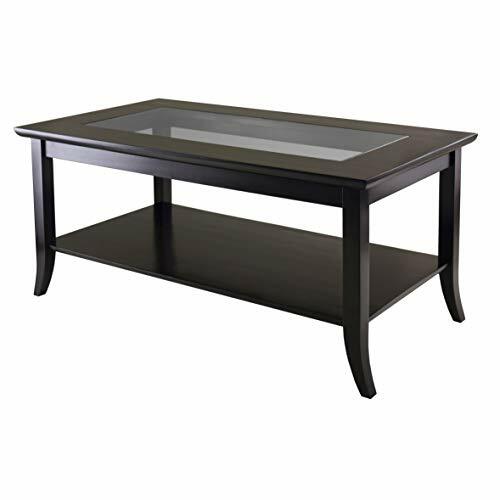 The Winsome Genoa Rectangular Coffee Table has a glass top that will add a bit of sophistication to the room and, while of course glass is breakable, this glass is tempered and hardy enough that it won’t shatter under use. And that glass won’t get water marks or stains as easily as a wood table would. The wood is a composite and solid wood blend, making it light and affordable; only 41 pounds and $100. The table itself does require some assembly (as most shipped tables will), so you’ll need to be sure you’re assembling it properly if you want it solid. The good news is, that’s easy to do. Most reviews say they completed assembly in less than 20 minutes. For right around $100, you can pick this coffee table up and the reviews on Amazon lead us to believe you won’t be disappointed. There are just under 200 customer reviews giving it an overall rating of 4.2 stars. For a coffee table that will give you what you need without breaking your budget, pick up a DHP Parsons Modern Coffee Table. The DHP Parsons Modern Coffee Table is beautiful in its simplicity. It’s a 4 legged table made of a composite wood that’s both easy to put together and easy to move around. Even though the wood is not solid, the look is made to appear that way. With a wood grain finish, you’d hardly be able to tell it isn’t and should you choose to buy matching side tables, those are also available on this listing. The table itself is only 10 pounds, making it easy to move and with only 5 pieces of wood to assemble, it’s also easy to put together. The weight capacity of it is 50 lbs and while that’s not the maximum that perhaps other tables can offer, it’s more than enough for your remotes, dinner, and drinks. This coffee table has an impressive number of reviews on Amazon: nearly 4,000. And not only that, but it has a more than respectable overall rating of 4.3 stars. But our favorite part of this is by far the price: you can pick this up for right around $35. The International Concepts Hampton Square Coffee Table is made with a high quality wood that you’re sure to love. The International Concepts Hampton Square Coffee Table comes unfinished, so you’ll get to choose exactly what kind of look you want. It may take a bit more work than a table that’s already finished, but with the options that open, it may very well be worth it to you. If you’re looking for inspiration, we love the possibilities that perusing the customer reviews provided. You can stain, or paint, or a combination of both. You can tile the top or place a sheet of glass atop it. There is no shortage of potential on this. This is a nearly square table, (a bit longer than it is wide), so you’ll need to make sure your space will fit such a big table. The open bottom shelf is held with two X frames on the longer side and with the other two sides completely open, you’ll easily be able to use it for just about anything. On Amazon, this coffee table has an overall rating of 4.6 stars and around 150 customer reviews. That’s enough to suggest that, should you buy one of these, you’ll also be one of the majority of its satisfied customers. The Simpli Home Avalon Storage Ottoman is a ottoman coffee table that will add function and comfort to your home. The Simpli Home Avalon Storage Ottoman has a whole lot of function for such a simple design. At first glance, it’s a standard ottoman; you’ll have a comfy place to put your feet and toss your remotes. But the top three cushions also lift up to reveal a large storage compartment that will easily hold a whole mess of your possessions neatly and hidden. It’s ideal for throw pillows or comfy blankets, but anything that fits in its 13 by 38 inch compartment works! The best part is, the storage is covered by three lids that function independently. You can open one while another two keep their feet comfortably propped. And the lids each flip to reveal a flat tray top. So you can have the middle lid always set to a tray while the other two are cushions. That would be a perfect solution to comfy footrest along with a tray for drinks and foods that may spill. With over 550 customer reviews on Amazon, this coffee table has earned an impressive 4.6 star overall rating. With that many positive reviews, it seems to us the risk is certainly minimized with this purchase. So many uses exist for a coffee table that we venture to guess most, if not all, homes will benefit from a coffee table at some point. If you have a TV in the room, then the coffee table will conveniently provide a space for organizing the remotes, controllers and other electronics that find their way to your couch. You can place your dinner on the surface, or even pick up a lift top that will transform your coffee table into a TV tray, making dinner all the more comfortable, or a desk, making work easier. Not to mention the potential of family game night being a possibility in your home beyond the dining table. If you have a coffee table in a sitting room or don’t have a TV in the room with your couch, then you can use the table for a purpose more closely related to its original; coffee. You’ll have a surface to place your book or laptop when you leave and a place to keep your coffee, tea or other beverage while you’re enjoying your company or a nice warm fire in your electric fireplace. In short, a coffee table is a convenient furnishing for your living room or family room, and it’s useful for a variety of purposes. Space and shape. You’ll, of course, need to consider the space you’re going to be using before you purchase your new coffee table, but you’ll also need to consider the shape in relation to said space. That is, if you want to use the space to spread out your work and your family’s pizza and popcorn on movie night a larger surface may be best for you. In that case a square shape may work beautifully. However, the square may impede your walking space. Likewise, you may love that a round or oval coffee table will pose less risk for bumped toddler heads but it won’t work as well if you plan on placing it flush against a wall or couch. Lift top. If you’re just not sure how often you’ll use the lower height of a coffee table, a lift top may be the best bet for your home. Even if you’re sure you’ll use the lower height frequently or if you think the lift top will be used most frequently, the entire point of a lift top is that you won’t have to make a permanent decision before purchase. You can eat your dinner without being hunched over the lower coffee table and you can place the top back down to rest your feet on without any restricted views while watching your favorite TV shows. Trunks. While you may not consider a trunk a traditional “coffee table,” you can certainly use this alternative as a dual purpose addition to your room. Not only can you use it for storage – which is probably a pretty obvious use – but that storage can be permanent or temporary. Because the storage is right in front of you and is far from being an eye sore, this will open up your room to all kinds of possibilities. The most common will probably be the popular use: throw pillows and blankets for chilly nights. But you can use this for games and make it all the easier for your family to reach when the mood strikes or as a “hope chest” of sorts; storing all your little ones most precious art projects. And because of its durable and hard top, you won’t have to worry about storing more delicate items. If you don’t have the space in your kitchen for all your less commonly used appliances like a pressure cooker, or deep fryers, then keeping it just a room over in the coffee table trunk seems a wonderful option, too. Ottomans. This may also not merit the title “coffee table” in your mind, but the fact is, an ottoman can give you the primary function of a coffee table with a whole lot more comfort. And, not only will it be more comfortable for you to put your feet up on this rather than your standard coffee table (that extra cushion goes a long way for sinking your feet in), you’ll also be able to use it for additional seating. If you worry about spilling, there are a few precautions you can take, the easiest being using a tray of some kind to ensure a flat surface for food and drinks. And, should you choose a tray with deep sides and waterproof seals, the tray will contain any mess you may make. Casters/rolling wheels. If you plan on moving your coffee table often, then it being on wheels seems like a perfect solution to offer you that extra bit of convenience. This is especially convenient for clearing space in the room or for regular re-arrangement of your furniture. So should you have a little one who wants to act out a play or show you his sweet dance moves, it’s just a simple matter of sliding the coffee table away to create a dance floor. You could use this for family sleepovers where you place sleeping bags in front of the TV and fall asleep watching movies together or just to clear the floor space for crafts or wrapping paper. Nesting set. You may want to make sure that your coffee table matches your room and the easiest way to do that (as it is with any room) is to buy a matching set all in one go. A nesting set will allow you to buy a coffee table as well as a side table or two of the exact same style. And the biggest benefit of nesting tables is that when not in use, you can store them within each other, making them ideal for small places. So even if you have a tiny apartment, you can still have all the tables you need. Do you need a coffee table? You probably need some sort of coffee table in front of your couch to offer the most comfortable arrangement of your room. Traditionally, that has been a coffee table because the coffee table is large enough to house all you need at your fingertips during your couch lounge. That, obviously, started out as a place to put your coffee but your controllers need a home within reach, as well. (And the more time goes, the more controllers we seem to have.) Your living room may be the most comfortable place in your home and providing yourself and your family a table that will allow you to maximize its efficiency can only help. You may find an alternative to a coffee table that will give you all the function you want, but none of the unnecessary bulk or waste of space. An ottoman can offer additional seating, or a trunk or tray table may be enough. You can place two side tables together for a version of a coffee table that comes apart and offers a bit of furniture range or you can even put sleek garden stools in place of a table to make sure you’re optimizing your room. What is the average size of a coffee table? If you’re interested in what has traditionally been considered the standard sizing for coffee tables, then you’ll be planning for a rectangular (or maybe an oval) coffee table to go directly in front of your “standard sized” couch. By placing the coffee table in front of a couch, you’ll want it to be roughly 2 inches lower than the seat and about two thirds the length. In this case, we mean a traditional, 3 cushion couch; not a love seat and not a sectional. Roughly 7 feet wide (84 inches) with the cushions 18 inches high. So your coffee table will be 64.5 inches long and 16 inches high. 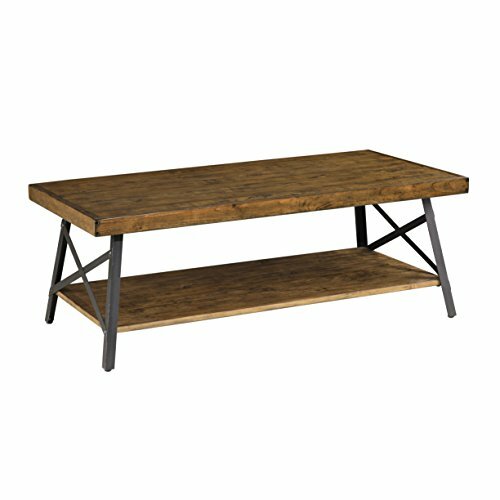 How big should my coffee table be? Because there are now significantly more shapes and sizes for a “standard” coffee table, this question may not be as easy to answer as it used to be. The availability of variety is only improving and each time the range expands, the more likely you are to get exactly what you want. For taller individuals, you may need a couch that has a higher seating (or lower for shorter people) and that equates a taller coffee table. If you have a sectional, you may need to find a smaller width so as to make sure you have plenty of space to walk around the table. In case you haven’t picked up on it yet, your coffee table should compliment your other furniture. So don’t make the coffee table your first purchase. Make sure you’re still getting the functionality you want and you have the surface you need. Cramped spaces will require smaller coffee tables to prevent restricting movement and would serve you well if they also provided storage. How much space should be between a couch and a coffee table? In order to be able to use your space most effectively, you’ll want between 12 and 18 inches clearance between the couch and the coffee table. If you’re placing a round or oval table there, measure from the widest place in the table to make sure you’re going to be able to get around it at all times. Longer legs may require larger gaps but for the most part, 18 inches will suffice for any family. Also keep in mind that for lift top tables, the 12 to 18 inches will need to be from the extended edge, as well. Just another note on spacing, though: if you plan on eating at the coffee table, you’ll want to keep in mind that you’ll probably move the table closer and then push it back away after you’re done. Casters or wheels may be a good investment if you do this regularly, but even if you opt not to you will still need to choose a smooth-moving table or purchase sliders of some kind. As if the appearance of this ottoman wasn’t enough of a seller, it also opens up to reveal ample storage. The top of this ottoman slides off completely to give you a bit of extra storage in your room. This ottoman is covered in an inexpensive and durable luxury faux leather with solid wood legs. This handmade ottoman is a classy addition to your room that is a wonderful example of blending comfort with sophistication. 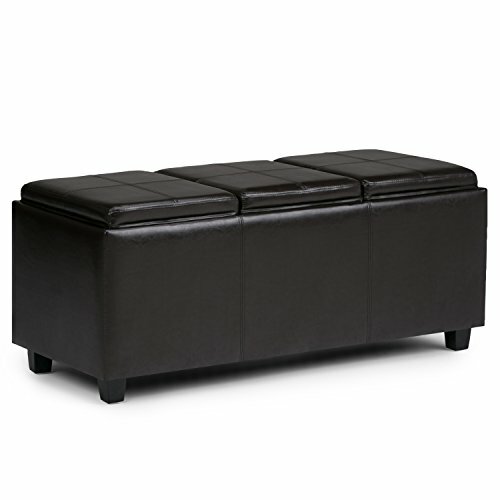 This ottoman is made with bonded leather and features a tufted top. The top of this table lifts up to 28.5″ – making it a wonderful height for your meal or laptop. The Sauder brand has so many coordinating pieces, you won’t need to worry about finding furniture to match this coffee table. 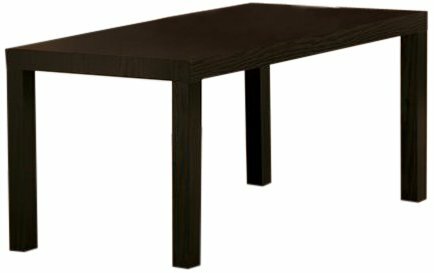 This table is made of a 0.6″ MDF board and iron hinges making it a durable addition to your home. This trunk is made with a hardy manufactured pine veneer with solid pine feet. This heavy duty truck weighs 61 pounds on its own, so once you put something inside, you really won’t have to worry about it accidentally slipping or sliding at all. 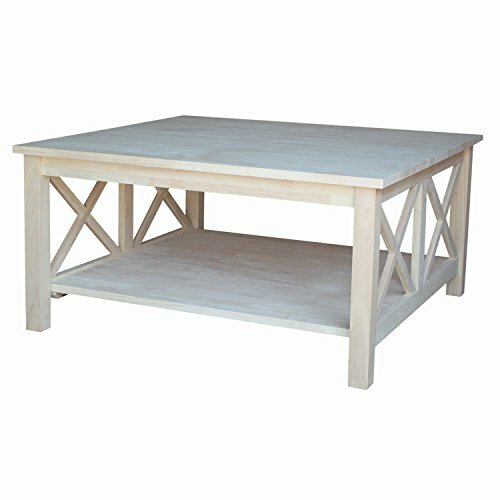 This square coffee table will give you plenty of space for you and your family to spread out your things. Multicolored rustic paints make this the perfect addition to your relaxed-vibe room. This coffee table has a plank-style top in a modern-meets-industrial design. This coffee table has a simple design but, especially with the bottom shelf, it is incredibly functional. This coffee table has a hollow board MDF table top and a sturdy chrome X base. This gorgeous table has a unique feel precisely because there are no two tables exactly the same. This table is a piece of art that will inevitable be a focal point of your room; it’s a good thing this is such a beautiful one! The adjustable feet on this table are so high quality you won’t need to worry about it scratching or scuffing your floors. This table is made with a waterproof and dust resistant MDF laminate tabletop that will add to its durability and longevity. The lower shelf of this coffee table will provide an open space of 6.5″ – giving you plenty of space to keep your magazines, books, controllers, or remotes.